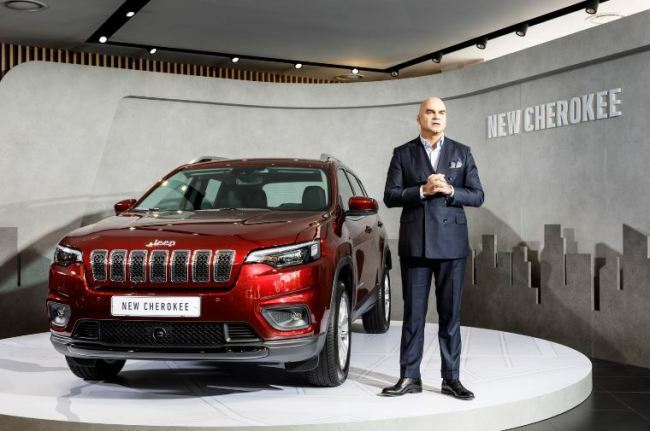 Fiat Chrysler Automobiles Korea rolled out a face-lifted version of the Jeep Cherokee midsize sport utility vehicle for the first time in four years, in line with the starting point of its business strategy to focus on the Jeep SUV brand, the company said Tuesday. “We will focus all efforts on selling SUVs through Jeep. This year we will change 90 percent of our network to Jeep-exclusive showrooms” emphasized Pablo Rosso, president of FCA Korea, in a media event held at the first Jeep showroom in western Seoul. He added that backed by a rise in demand for SUVs and Jeep vehicles here, Jeep will aim to post double-digit growth this year. The Jeep brand saw a 38 percent on-year rise in sales, and sold 7,012 vehicles here in 2017. As part of a strategy to cash in on SUVs, FCA Korea will revamp all its showrooms to be Jeep-only by early next year, the company said. The number of Jeep vehicles sold here accounted for 96 percent of 7,284 units sold by FCA Korea last year, data from the company showed. “While changing all FCA Korea showrooms to Jeep-exclusive, we will think over ways to more effectively introduce our sedans. Strategies for sedans are not yet decided,” said the spokesperson of FCA Korea. FCA Korea currently has 17 showrooms nationwide, and plans to add two more within the year. Rivaling the Toyota Rav4, Honda CR-V and Kia Motors Sorento, the annual sales goal for the new Jeep Cherokee has been set at over 2,000 units, the company said. Sales of the Jeep Cherokee saw a 136.9 percent on-year hike here, totaling 1,817 units last year compared to 767 units sold in 2016, the company said. The new Jeep Compass SUV is scheduled for release in the first half of this year here, followed by the new Jeep Wrangler and Jeep Renegade face-lift later this year. If the revised agreement is finalized, Korea would lower the bar for US car imports, doubling the quota for cars exempted from Korea’s separate environmental and industrial checks to 50,000 units. FCA Korea is also reviewing with the headquarters to introduce the Alfa Romeo brand, Rosso added.